Just a short post, being Memorial Day. Also a short post based on the length of the song. This will probably be the shortest gem in the series. But well worth it, and fairly topical for those enjoying this holiday with BBQ and too much food. Before we get to the song, let's take a gander at one of the few decent images from 2014 Topps. Too much crop can lose a lot of the premise of the action. What's going on? What's the context? Fortunately, for a play at the plate, you can chop out the background and we still know what's happening. A player in mid air. Concentration in the catcher's eyes. The anticipation of the pending collision. 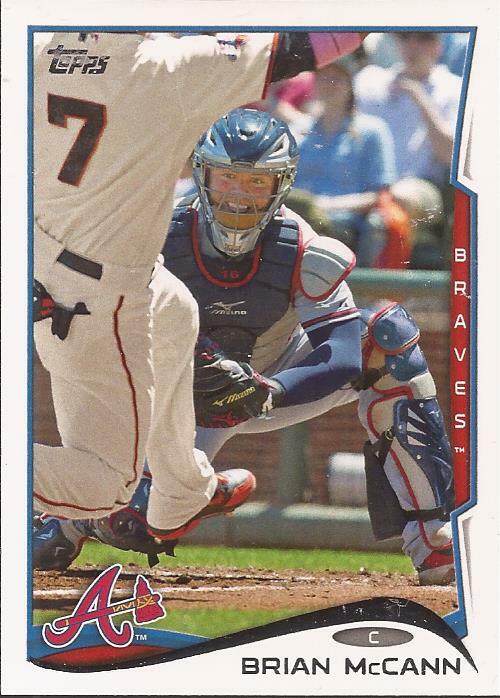 Though a bad design, perfect framing on McCann's face makes this card. When my wife and I first started dating, we would send mix tapes back and forth while she was at school. This song appeared on one from her, and it's 66 seconds of brilliance. It's from a Cincinnati radio station album of local bands. I lost the tape. But I always remembered the song, and 25+ years of searching later, now you will remember it too. This song appeared in the B movie Frostbiter: Wrath of the Wendigo. Pretty forgettable. I almost had to use that video in this post, but I'll add that YouTube video to the playlist. You can download this song, and many others, from the I Heart Radio link in the paragraph above. Speaking of paragraphs, each one in this post is 66 words long. I'm so meta.